Rob Pliskin began gentling wild horses in 1998 at national workshops presented by the US DOI – BLM Wild Horse and Burro Adoption Program. In December 2006, while a trainer at Lifesavers Wild Horse Rescue in Lancaster, CA he developed clinics in Equestrian Education and brought the EAGALA model to Lifesavers. EAGALA is the Equine Assisted Growth and Learning Association. The EAGALA model hosts clients in coaching, learning, counseling, and psychotherapy sessions with a team of a licensed coach-therapist, an equine specialist, and horses or other equines. EAGALA includes growth and learning sessions, workshops, team-building, and leadership development activities. Rob has been a member since 2003. As a natural horsemanship instructor and clinician, Rob has appeared at the Wild Horse Festival of Learning in South Jordan, UT, the Wild Horse Workshop in Stagecoach, NV, and Napa, CA BLM Mustang Day. Rob co-founded the EAP program at Big Heart Ranch in Malibu, CA for adolescents in 2005. 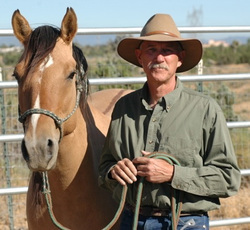 In 2009, he was the Equine Specialist at In the Presence of Horses, a full service EAGALA program in Grass Valley, CA. In 2011, he helped found the equine assisted program of Rustler Ranch in Ashtabula County, OH. His clients have also included Leadership Geauga County, OH; Genentech; and the Israel Defense Forces (IDF). Since 2010 Rob has been an adjunct instructor at Lake Erie College, teaching Equine Assisted Learning and Psychotherapy. He has a special interest in providing services to communities, businesses, and Veterans and their families through the EAGALA Military Services initiative. Besides training at the Gestalt Institute of Cleveland and holding an MS Ed as an educator, Rob completed the MSSA degree at Case Western Reserve University in May, 2012, to become a Licensed Social Worker and enhance his work with people and horses. Rob is an international conference presenter and is on the boards of The Cloud Foundation and Trauma and Resiliency Resources, Inc.